Founder of Home of Hope, Ms Khanyisile Motsa, with Mr Luke Harwood from Medscheme and the cheque of R250 000. 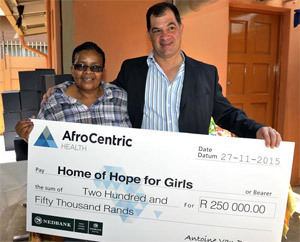 AfroCentric Health, through its subsidiary Medscheme, recently made a donation of R250 000 and 75 shoe boxes filled with gifts to the Home of Hope for Girls. The donation is aimed at contributing to the education and wellness support for over 75 girls that are currently being looked after by the home. Home of Hope is a place of safety for victims of human trafficking. The home gives the girls a stable family environment and helps them to overcome the experience. Some of the girls have to deal with being HIV positive. The home also assists with tracing the families of the rescued girls with the aim of reuniting the families. However, the reality is that often many of their beneficiaries end up in the organisation’s Orphan Care Support as the parents are usually deceased. Medscheme General Manager of Quality Assurance and Projects, Mr Luke Harwood. “The girls at Home of Hope have had major life challenges and it is only through individuals, as well as corporate donations, that more and more girls can be rescued from human trafficking and abuse to be given a chance to succeed in life,” said Mr Harwood. Founder of Home of Hope, Ms Khanyisile Motsa said, “Human trafficking and sexual abuse is a rampant challenge in the country; during the holiday season we are bracing ourselves to deal with more children who are facing this plight. The home has two child youth care centres and the girls are given educational support to see them through primary, secondary and tertiary levels. Currently, the home has 31 girls at tertiary institutions and the rest of the girls are in primary and secondary school. The donation will assist to keep the girls in school and help them create a future for themselves. “We are grateful to the AfroCentric Health Group for this major donation and for their continued support,” said Ms Motsa.